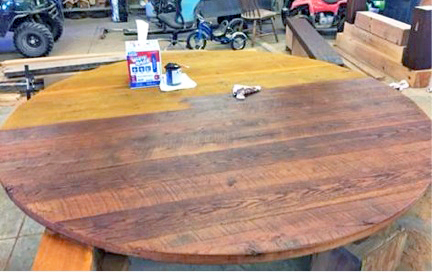 Check out this amazing hand crafted table from Marion Lovett! It first got a got of GF Amber Dye Stain, then a coat of Candlelight Gel Stain (shown in the second picture). 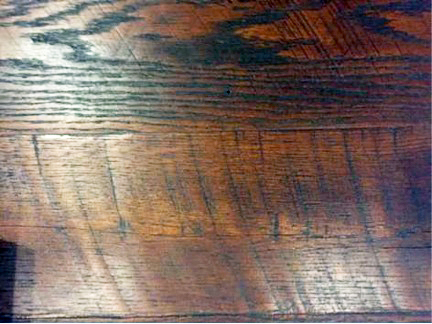 Then 2 coat of Antique Walnut Gel Stain were applied and the entire table was sealed with 4 coats of Arm-R-Seal Topcoat. Marion says, "It is 8' in diameter and made of old barn wood (oak). The bottom was timberframed in the traditional fashion with mortise, tenon, and pegs. I was aiming for an old medieval look. I used all General Finishes products - which is the first time I've used them. I am very pleased with the outcome and love your products. 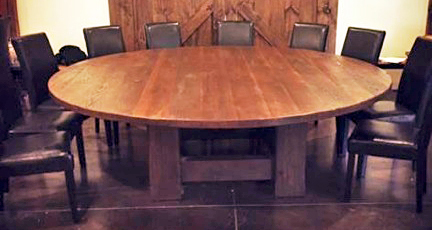 We estimate the table to weigh about 800-900 lbs which made finishing it quite a challenge (it is finished on both sides). Thanks again for a great product. I will be recommending General Finishes to others."